My blog is slowly turning into a running blog with random healthy recipes added to each blog post. I am not sure I like this new direction yet. It all seems less coherent. On the other hand, my running rules my life these days. The Berlin marathon is done and dusted but had kept me busy for several month. You got your fair share of it. The Dubai running season has just started with the first 10k race last weekend. I am at a loss how to accommodate both in a more synchronized way. Hence the less regular posts/recipes these days. Have I mentioned before that I am studying to become a Personal Trainer? I have already been asked to develop individual training programs for friends to prepare for half marathons, full marathons or simply to get off the sofa. Recently I was asked by a parent in my kids' school to design an exercise program for her that will aid weight loss.We haven't started the program yet. I am curious to see whether I will get someone to implement long-term dietary changes in order to achieve results. If you ask me, the dietary side even more difficult than getting someone to exercise. A Dubai-based fitness company laid out some food rules to go with their exercise program and I agree with it: getting in shape is 20% exercise and 80% food. You cannot out-train a bad diet. Good bodies are built in the kitchen and polished in the gym (or wherever you exercise). My personal workouts and nutrition go hand in hand. I eat, I sleep, I work out, I run, I race. I am convinced that there is an interdependence between my diet, my sleep, my workouts and my race performances: My food choices impact on the quality of my sleep. Both sleep and food quality impact on my training quality and training load which translates directly to the quality of my race performances. Exercise and food complement each other. I get the occasional feedback from you guys that you enjoy my rantings about my running. Perhaps I should get a little more serious and share more of scientific running and exercise data that I read and put into practice on a daily basis, instead of emotional ranting about my injuries, training hiccups and races successes. Would you be interested in that? 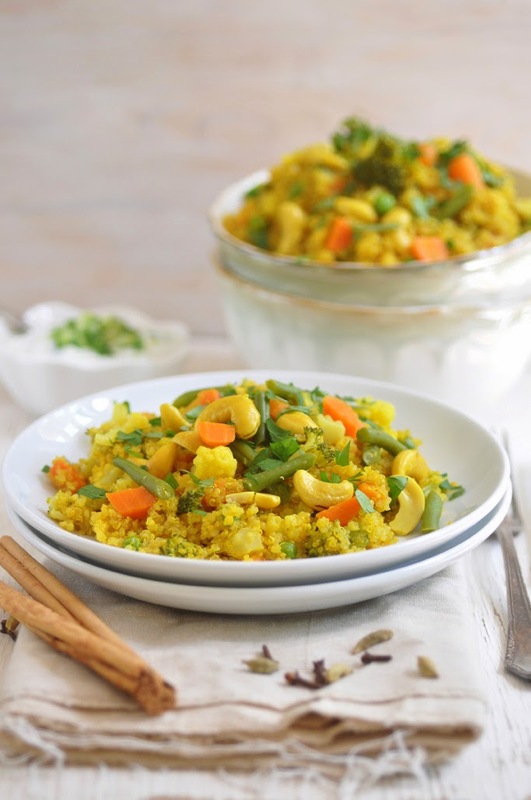 Today's recipe is a spicy quinoa pilaf that I made when I cam back from the Berlin marathon. It's a vegan bomb of nutritious ingredients, full of vegetables and spices that have anti-inflammatory properties. An ideal dish to recover from a strenuous race, a hard workout, and to keep the immune system up to fight off any cold or other bugs before they can spread out. I hope you enjoy! In a skillet, heat coconut oil over medium heat. Add cinnamon, cloves, cardamon, ginger, garlic and turmeric and fry until fragrant. Stir in raw quinoa, cauliflower florets, chopped carrots and cashew nuts. Add water, season with salt, bring to a boil, cover skillet and cook for 10 minutes over medium low heat. After 10 minutes, add green beans and broccoli and cook for another 5-7 minutes or until all water has been absorbed. Stir in green peas and let stand for another 2-3 minutes. Remove cinnamon stick, cardamom pods and cloves. Transfer pilaf to serving bowl, Garnish with fresh chopped cilantro. Serve immediately.